View of the Hot Wells near Bristol. 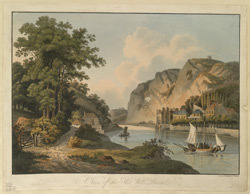 Hotwells was a spa resort, which had been developed out of a hot spring, discovered in the rocks of the Avon Gorge. The Spring was in the manor of Clifton owned by the Society of Merchant Venturers of Bristol. Several improvements were made including building a pump to raise the water, a Hotwell House and a new road to make access to the spring easier. Daniel Defoe visited the spa in the early 18th century and described 'The rock has since been work'd down, partly by strength of art, and partly blown in pieces by gunpowder, and a plain foundation made for building a large house upon it, where they have good apartments for entertaining diseased persons. The well is secur'd, and a good pump fix'd in it, so that they have the water pure and unmix'd from the spring it self'.